(CBS News) Pop singer Katy Perry helped kick off Fleet Week in New York City on Wednesday night with a special concert for troops. The singer, wearing an American flag-style dress, and her camouflage-clad backup dancers performed at the event at Brooklyn's Pier 9. Before Perry went on stage, she told MTV News that she was thrilled to put on a show in the troops' honor. "I think if anyone deserves a party, I think it's probably the people in service. They are the ones that are actually deployed and protecting us from all the bad guys, and they deserve to celebrate, and they deserve to be celebrated," she said. "I've always heard about Fleet Week in New York; I've never been a part of it. It's really exciting to see a lot of seamen in white, but they all look gorgeous. It's kind of vintage-y feeling and really patriotic, and I love a theme. So, it's really cool to be a part of this and be entertaining for them. I think that it's appropriate to go out there in a little dress, and they're all in uniform." 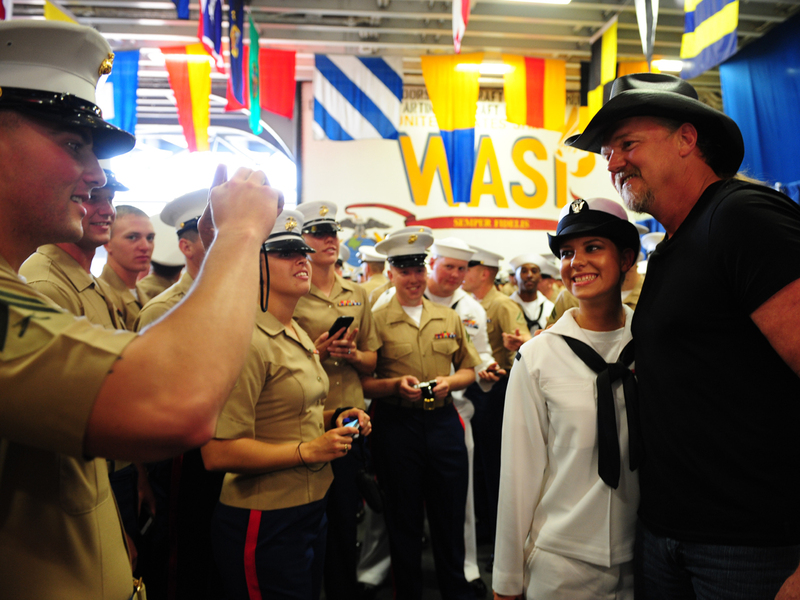 Country singer Trace Adkins is also participating in Fleet Week festivities. On Wednesday, he boarded the USS Wasp to welcome the ship's crew to New York City (see a photo below) and gave a free concert for sailors at the Hard Rock Cafe in Times Square. On Thursday, he'll perform the national anthem to kick off the Intrepid Sea, Air & Space Museum's 21st annual "Salute to Freedom" dinner. That evening, Adkins and his band will also perform for those in attendance.